Spring is finally here and you could save up to 30%. Save 10% when your order totals $35 or more, using promo code: SPRING10. 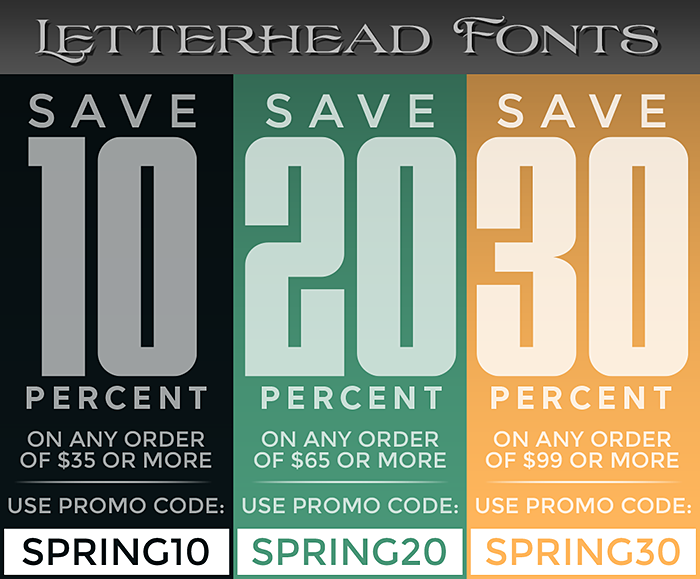 Save 20% when your order totals $65 or more, using promo code: SPRING20. Save 30% when your order totals $99 or more, using promo code: SPRING30. Sale ends April 17th, so go ahead and use all three codes (one at a time, of course). Excludes already discounted packages. 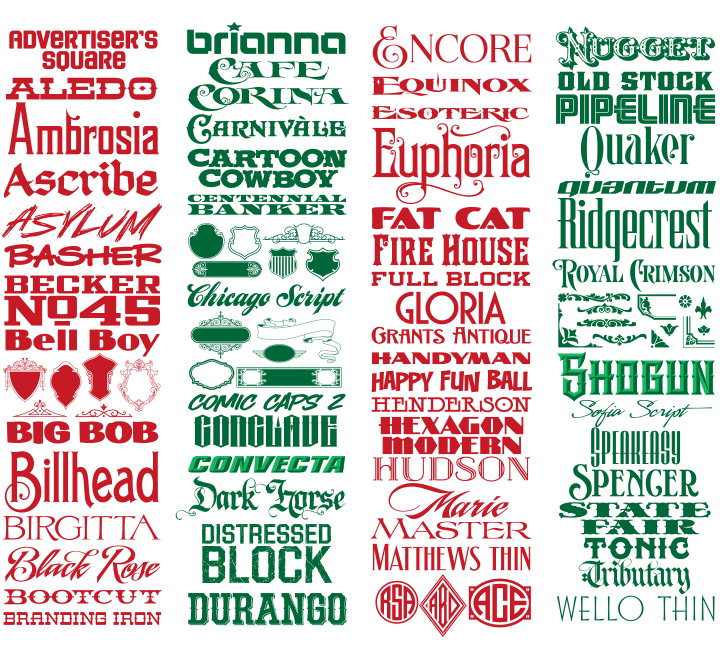 Just a reminder that Chicago was a truly ugly font... and that you can save 30% on your purchase of $55 or more when you use promo code: SAVEU30. Promotion ends March 8th, so download several to take full advantage while you can. Excludes special packages and multiple licenses. We've made improvements to LHF Speakeasy. In the new 1.3 version we've fixed an issue which caused the "Her" ligature to display improperly. Please uninstall all 3 of your existing LHF Speakeasy fonts. Then, simply log in to your account and download the entire .zip package for the order again. You will receive the new 1.3 versions of LHF Speakeasy released today (Feb. 14th). You can easily check which version you're using by typing the bar character ( | ). The version number and date will be shown. Please follow these steps for updating your fonts. We've made improvements to LHF Dark Horse. In the new 1.1 version we've included an all new, non-distressed, solid version (titled LHF Dark Horse 3). Please uninstall both of your existing LHF Dark Horse fonts. Then, simply log in to your account and download the entire .zip package for the order again. You will receive the new 1.1 versions of LHF Dark Horse released today (Feb. 13th). You can easily check which version you're using by typing the bar character ( | ). The version number and date will be shown. Original: This design isn't doing the owner any favors. The graphic takes up the bulk of the space and yet it's not immediately clear what it is. (An angry looking cloud isn't going to make a positive impression on people.) The lettering is hard to read due to the font and the decision to put it on an arc. Outlining this shade of green with black doesn't help. Green seems like an unnatural color for something having to do with clouds and either heating or cooling. Redesign: We catch the eye using a script (LHF Piranha Script) which carries the eye across and gives it a sense of a motion. Changing the color to blue seems like a better choice for heating and cooling, plus it's clean. Add a simple dark fade at the bottom to add contrast and help with readability. A light gray compass in the background provides interest and also acts as a bullseye to draw the eye into the beginning of the word. We drop the "LLC" because it's unnecessary and contrary to popular opinion does not really have to be used on all advertising. A simple clean design that took only minutes to create. Save 30% when your order totals $99 or more (use promo code: SAVE30). Save 40% when your order totals $199 or more (use promo code: SAVE40). The more you order, the more you save, so take advantage while you can. Promo excludes LHF Iron Lace (which is on sale for 50% off). Ends November 1st. We've made improvements to our cart system to speed up large font package downloads, such as those containing the complex LHF Versatile fonts. In addition to speeding up the download process, we've also included a progress bar in the download window, which displays the font compiling & zipping process. We're pleased to announce the release of LHF Scarlet Script by Denise Bayers. Experienced designers will appreciate the versatility Scarlet Script provides, while beginners will find it very easy to acheive professional results using the various overlays. Denise very carefully hand-crafted each letter to flow naturally into the next in order to retain the hand-lettered appearance. Each font includes a generous 64 alternates, including special ending swash letters. Download this 5 font set for only $49 (through 7/30). We're pleased to announce the release of LHF Swindler by Mark Searfoss. Swindler immediately evokes the authentic feeling of the Old West with its dominant square angles and subtle serifs. Mark expertly crafted this unique font set with every letter in mind to ensure that overall balance and tone were correct. You receive 3 versions: Regular, Spurs and Weathered. Try using the Weathered version on wood backgrounds for a rustic look. Swindler is a must have for designers needing an extended, horizontal font with western appeal. Download all 3 versions: Regular, Spurs and Weathered, for only $49 (through 7/30). Please uninstall all 11 of your existing LHF Emporium fonts. Then, simply log in to your account and download the entire .zip package for the order again. You will receive the new 1.1 versions of LHF Emporium released today (May 3rd). You can easily check which version you're using by typing the bar character ( | ). The version number and date will be shown. We've made improvements to LHF Heller's Script. In the new 1.3 version we've fixed a bug that was disabling the kerning in some programs. Please uninstall both of your existing LHF Heller's Script fonts. Then, simply log in to your account and download the entire .zip package for the order again. You will receive the new 1.3 versions of LHF Heller's Script released today (April 10th). You can easily check which version you're using by typing the bar character ( | ). The version number and date will be shown. We're pleased to announce the release of LHF Robusto by Mark Searfoss. This is the 5th vintage style font by Mark and was inspired by early American cigar box lettering. It features Regular, 2 Inset, and 2 Block Shadow versions, plus 20 bonus alternate characters to help you design with ease. Download this bold, 6 part multi-layered set now and save $7 until January 23rd. Watch for this new 7 font set from Charles Borges. Versatile is a a clean, easy to read style perfect for lgos and signage. Each font will contain 1,462 glyphs. We've made improvements to LHF Dublin. In the new 1.2 version we've fixed a bug which caused one of the lowercase alternate t's to become uneditable in some programs. Please uninstall all 8 of your existing LHF Dublin fonts. Then, simply log in to your account and download the entire .zip package for the order again. You will receive the new 1.2 versions of LHF Dublin released today (Nov. 7th). You can easily check which version you're using by typing the bar character ( | ). The version number and date will be shown. We've made improvements to LHF Dixon Script. In the new 1.1 version we've fixed a bug within the OpenType programming that was causing the "or" ligature to display the wrong character. We've also improved point placement within each character in order to make offsetting paths more reliable. We recommended that you uninstall your existing version before you download the new 1.1 version, released today, Oct. 23rd. You can easily check which version you're using by typing the bar character ( | ); the version number and date will be shown. To get the updated font, simply login to your account and download the entire .zip package for the order again. Please follow these steps for updating your fonts. We're pleased to announce the release of LHF Amarillo 2 by Chuck Davis, Denise Bayers & Patrick Kalange. This 9 font set will give your design the subtle western, rustic feel it needs without looking over the top. Set contains 3 weights: Thin, Regular, and Bold. Each weight includes bonus layered Shadow and Rustic (distressed) fonts. Download this 9 part set now and save $7 until September 28th. We've made an improvement to LHF Branding Iron. In the new 1.1 version we've re-encoded the font so more programs have access to the alternate characters. We recommended that you uninstall your existing version before you download the new 1.1 version, released today, Sept. 10th. You can easily check which version you're using by typing the bar character ( | ); the version number and date will be shown. It has come to our attention that the Windows 10 Creators Update (July 2017) has a bug that may disable many OpenType fonts. Microsoft is aware of this bug, but wont have an update fixing the issue until the fall. We recommend that you wait until the fall update before installing the Windows 10 Creators Update. We will have more information soon. Here is an article with more details. Now until August 31st, save 10% on any order (use promo code: SAVE10). Save 15% when your order totals $100 or more (use promo code: SAVE15). 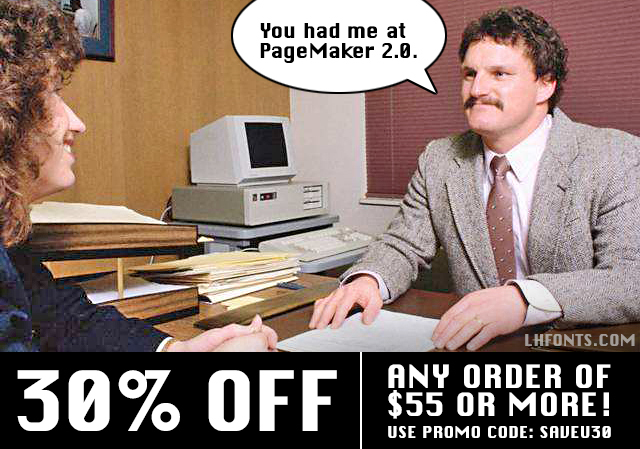 Save 20% when your order totals $200 or more (use promo code: SAVE20). The more you order, the more you save, so take advantage while you can!